It must have taken great self-control for George to concentrate on making a full synopsis of his book Tahiti when he was home on weekend leave, rather than simply keep writing it. But it was certainly the most rational approach. It must also have taken him a long time, as it had to be detailed. ‘Some parts of the book were practically finished,’ Kittie wrote in her Preface (1921), ‘others existed in many forms [my italics].’ Then there were diaries and ‘papers’ from which she had to make ‘direct selections’, and ‘very often the same matter was found in different versions’. In the synopsis, he had to make the source of the various elements of the composition that were to be fletched onto the timeline as clear as possible. What Kittie made from his synopsis is a masterpiece. Although I have a whole chapter in my biography devoted to what he did on Tahiti in 1906, reconstructed from both his own account and information kindly supplied to me by the Tahitian authorities today, I shall not be looking at Tahiti as a work of art until I get to the year 1921 in the chapter I am about to write — about Kittie’s life 1915-22. I will be very short of space, but I have been re-reading and thinking about the book for years, so it will be a huge pleasure to commit my conclusions to paper. Everything set down in this book is true. I have thought it important, for a right understanding of individual lives, and thereby a conglomeration of detail, to give a picture of the whole, to put down personal details which I have been told or found out about people. The only untruth is that I have sufficiently disguised the personality of those of whom they are told, so that no one should recognise them. Unless ‘personality’ meant for Edwardians something closer to ‘identity’ (which is not confirmed by dictionaries), George is saying that not only did he change people’s names, he changed their characters. Does this mean that, for instance, the unique, idiosyncratic, charming Tahiri-i-te-rai and Tupuna were not in fact like that? The suspicion reminds me of our discussion a few days ago about when is a biography actually fiction! Just possibly, one can see this at work in some of the pencil sketches and watercolours that he produced. Perhaps the reason he did not intend the watercolour I showed in my blog of 27 February to be published, and did not put the woman’s name on it, is that it was imaginary — his private idea of what Rarahu, the heroine of Loti’s Le Mariage de Loti, looked like? Compositionally it has several resemblances to Loti’s own drawing. Then I have long been intrigued by the sketch entitled ‘(Manu)’ that Kittie included in Tahiti. This is the sketch I have reproduced above right. In technique, intensity and wistfulness it always struck me as different from the rest. 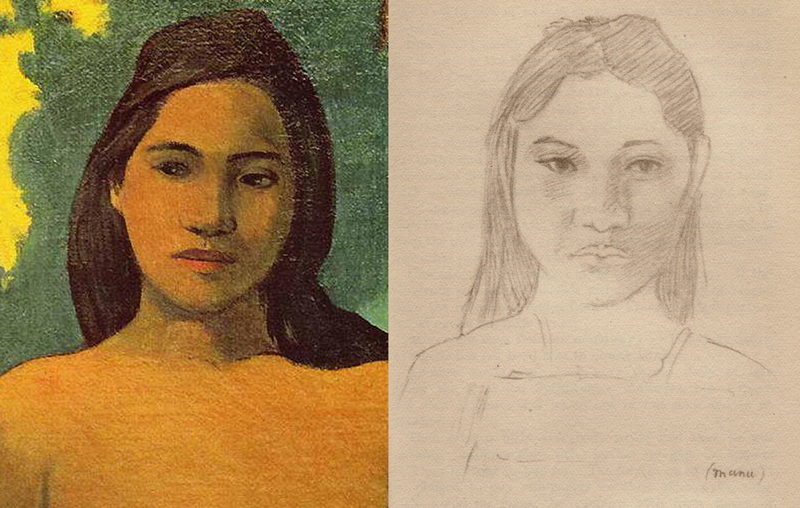 Then about three years ago I suddenly realised it reminded me of the figure in the left of Gauguin’s 1899 painting ‘Tahitian Women with Mango Blossoms’ — the figure reproduced on the left above. We know that George was deeply interested in Gauguin’s art, because he visited the famous First Exhibition of Post-Impressionist Paintings in London in 1910, which included thirty-six of Gauguin’s paintings, and wrote about it in the New Age. 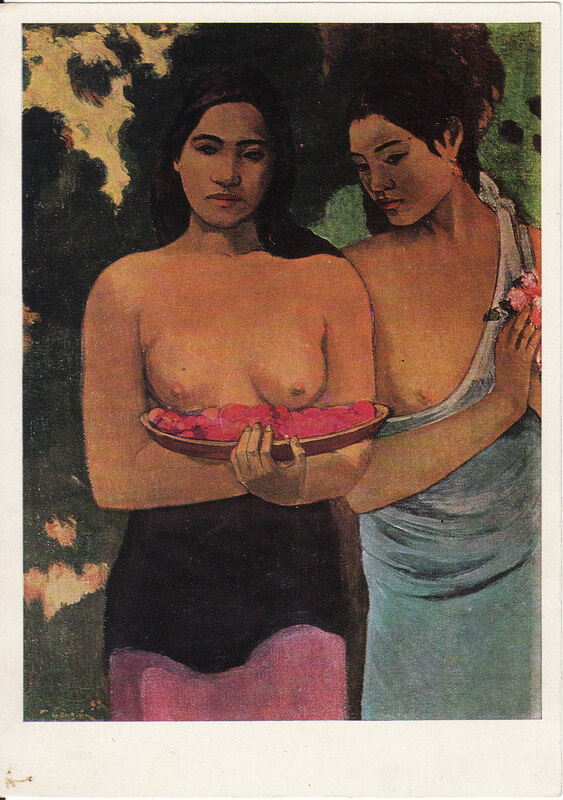 ‘Tahitian Women with Mango Blossoms’ was not shown in that exhibition, and I have been unable to track its ownership from, say, 1906 to 1914. But could George have seen a reproduction after he got back from Tahiti and drawn ‘(Manu)’ then, because he was reminded of her by the Gauguin figure? As with the ‘Rarahu’ painting, there are some distinct resemblances. It is also interesting that he has put ‘Manu’ in brackets, as though it was not ‘really’ her, not actually done from life. Not all of the drawings/paintings reproduced in Tahiti have the names of their sitters on, but ‘Manu’ is the only one enclosed in brackets. The other thing we have to remember is that the writing of Tahiti was an act of creative hysteresis, i.e. the creation came years after the cause. So, as Kittie stresses, it was a work of memory…and memory of course massages fact. Although it contains its barbed wire, syphilis, and brutes, is the Tahiti of George’s book an imagined world, a fictive one, and how close are those qualities to imaginariness and fictitiousness? I have a predilection for this image of Tahiti myself, because in the winter of 1972/73 in Moscow, surrounded by informers, KGB microphones, queuing, freezing fog, lies and mass psychosis, I came across a Soviet reproduction of ‘Tahitian Women with Mango Blossoms’ in a pack of postcards sold at a tobacco kiosk. Along with other ‘icons’, including sensu stricto Rublev’s ‘Trinity’, I stuck it on the snot-green wallpaper above my work table in the student hostel on Lenin Hills. People will say that it is quite obvious what the ‘message’ of this painting is from the central position of the blossoms and the breasts, but in my experience your eye very quickly fixes on the girls’ faces, which are so different, yet filled with the same gentleness, nobility, and security. The painting, even in this oddly coloured reproduction, helped me survive a year in the Soviet Union as a postgraduate. perhaps the future, or the murdered past. ash blue and faded mauve and deepest Pasque. a little to the side, beyond us here. but almost hides her own pale, thornless briar. This entry was posted in George Calderon, Personal Commentary, Timeline and tagged biography, George Calderon, Kittie Calderon, Manu, Moscow, Paul Gauguin, Soviet Union, Tahiti, Tahitian Women with Mango Blossoms, The Great War, World War I. Bookmark the permalink.